Are you looking for a small plant to grow on a windowsill that doesn’t require too much light or lots of care? 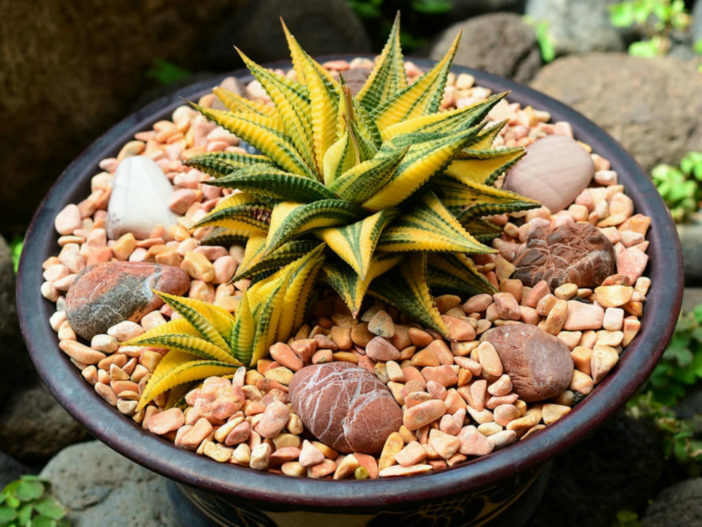 A Haworthia just might be what you need! This genus of many small succulents are great for their architectural interest, and their easy culture make them popular houseplants. The first written references to Haworthias go back as far as the early 1600s when European colonists were discovering the botanical riches of southern Africa. Early explorers took Haworthias back to Europe and they have probably been in cultivation there for nearly 400 years. They are readily available from home stores, garden centers, even the floral section of grocery stores; rare and unusual oddities are available from succulent plant nurseries. In Japan, where horticultural uniqueness commands high prices, Haworthias with special markings, forms, or colors can sell for hundreds of dollars; more common but equally appealing forms usually cost just a few dollars. Because they stay small, a nice representative assortment can fit comfortably onto a windowsill. They are easily grown as houseplants and during the frost-free period, can add to the décor of the patio table or the garden bench. Haworthias are native primarily to the country of South Africa, with a few species spilling over the borders of neighboring countries. They are closely related to Aloes and are in the family, Xanthorrhoeaceae. Two other related smaller genera are Gasteria, with red to orange flowers and about 15 species, and Astroloba, with about 10 species that have an elongated, columnar form. Besides their ease of cultivation, two other factors have made them a favorite group of both succulent growers and those just generally interested in gardening and houseplants. The first of these factors is their great diversity in form, shape and color. While almost all are of a general rosette pattern (the fan-shaped Haworthia truncata being the exception), there is endless variation in the details. Although there are disputes amongst the experts as to what defines a species in Haworthia, it is generally recognized that there are at least about 60 named species and about 150 named varieties. Additionally, there are differences in nature from one population to another, and even two plants growing side-by-side in the same population can have quite different coloration or markings. Nurserymen have selected particularly attractive forms. Also, some enthusiasts are developing interesting and unusual hybrids. The other factor that results in their popularity is their small size. Individual single plants are usually in the range of 1 – 3 inches (2.5 – 7.5 cm) in diameter, and clusters of several dozen stems can fit nicely in a 4 – 5 inches (10 – 12.5 cm) pot. This allows for a diverse collection in a small space, such as on a windowsill or under a set of fluorescent lights.